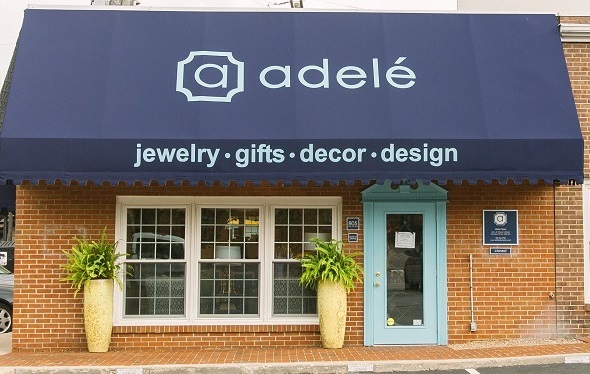 Adelé (pronounced a-de-lay) offers a product mix consisting of gifts, jewelry and home décor along with boutique interior design services. With a traditional yet fashion forward aesthetic, we scour the markets multiple times a year to bring the newest and best products back to our customers. Stylish Gifts: Our wide assortment of gift-giving options includes unique trinkets for a girl friend, a token of appreciation for the hostess, something special for the newlyweds, or a cute welcome gift for a new baby. Classic & Cool Baubles: We feature jewelry from some of the South’s most talented emerging designers. Fashion forward, trend driven styles at a variety of price points makes our selection accessible to most everyone. Fresh Décor: Our home accent offerings include upholstery, lighting and decorative accessories. Add a layered, polished look to any room with a curated selection from some of the brightest names in the home décor industry. Boutique Interior Design: The goal of our interior designers is to transform everyday living spaces into one-of-a-kind environments that radiate warmth, style and livable luxury. Services include in home consultations, custom furniture, designer fabrics, wall coverings, custom window treatments, reupholstery, paint selection and more. Let’s Get Social: Follow us on Instagram, Facebook, Twitter and Pinterest for daily doses of our favorite things including new merchandise, fashion and home inspiration.